Chinese New Year is an important Chinese celebration. It is a long festival that was traditionally celebrated for the first 15 days of the Chinese calendar. The first day of the Chinese calendar falls on the new moon between 21 January and 20 February. 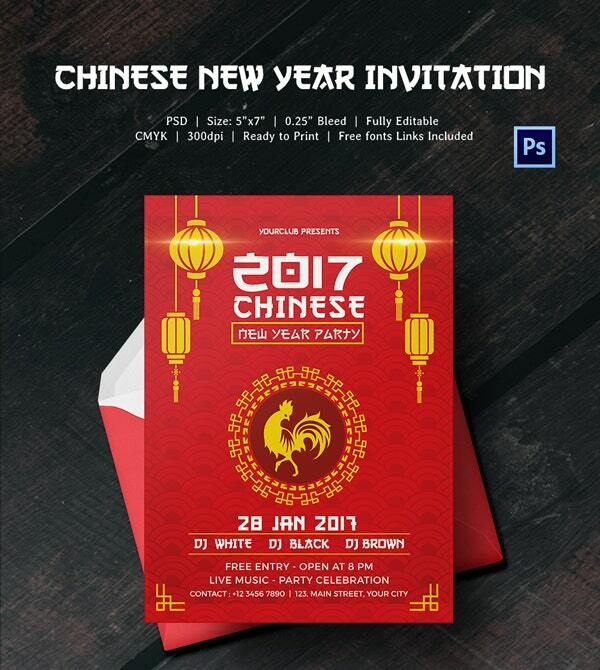 This year is going to be an year of Rooster, a cycle that appears in the Chinese zodiac every 12 years.To mark the coming of the chinese new year invitation template, we have decided to present some of our personally designed freebie stuff that you can use if you plan to celebrate this great chinese tradition. It all starts with an invitation! 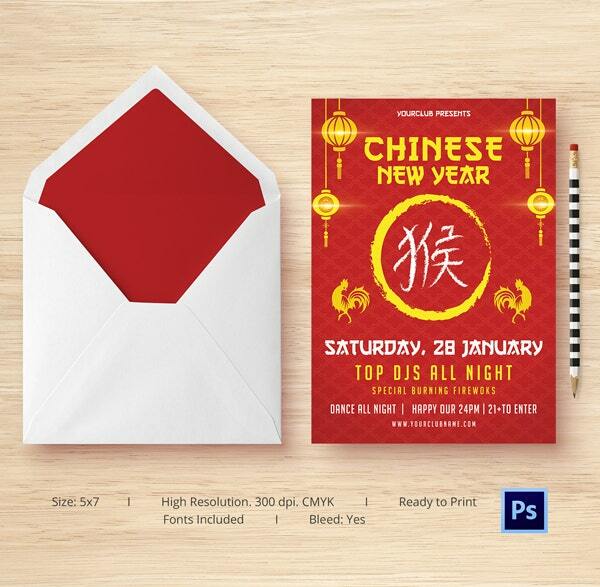 If you are throwing a new year party it is important to create some interesting invitation designs. Invitation cards also plays an important role in determining the party’s cool quotient after all. 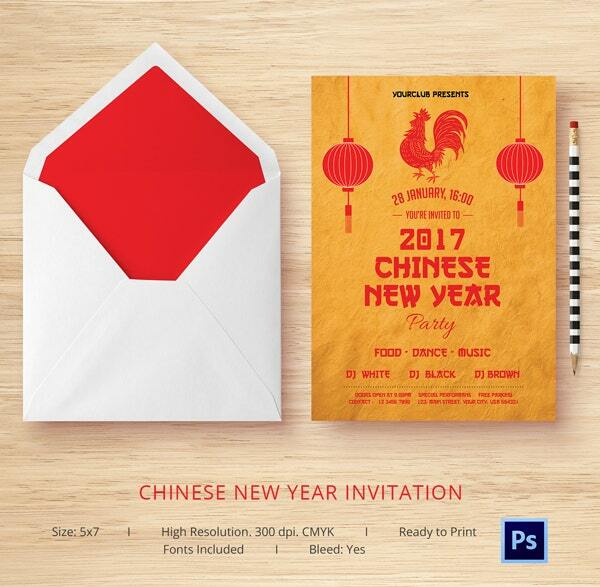 We have come up with some free invitation templates for you that will definitely help your party get a great first impression. Download the template from the link and you have to do nothing except adding your personal details, which is not going to take much time. You can edit the template on Photoshop. This is a striking invitation that would immediately hold the receiver’s attention. The design is impressive and also welcoming. Download the template from the given link and create a wonderful invitation for your friends and family. This is our personal favorite invite design and something we would highly recommend you to try. 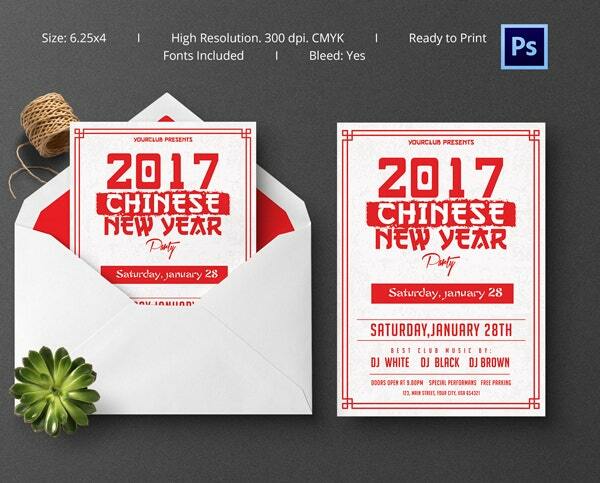 If you are planning to celebrate the chinese festival with a party we have an amazing chinese new year flyer template for you. And it is available for free download. It has been designed keeping the tradition in mind and the fact that this year initiates the year of Rooster. This fully editable file comes in PSD format. You can easily edit the file on Photoshop to add your details. Another flyer design, this time incomplete red, after all the color has such deep significance in the Chinese tradition and culture so we had to include it in the flyer design too. 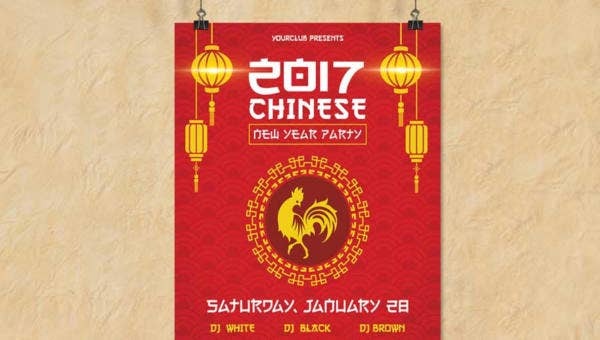 Also, the color makes the flyer look very attractive making it a well designed party flyer. 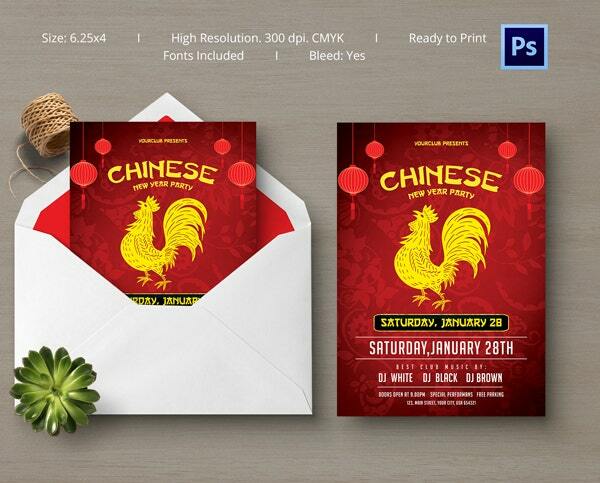 Download this flyer template to get a print ready, easily editable flyer design. You don’t have to spend on expensive design software or get the flyer designed by a Graphic Designer. The template save a lot of time and money and is great for end minute notice. The white and red combination looks interesting and also traditional. Inface it makes a great mix of elegance and tradition. Download this template if you want to bring on peace and serenity on your flyer design. Chinese new year is celebrate in many parts of the world along with China. Australia has a huge Chinese population and it the very much evident from the celebration of chinese new year that one can witness in Sydney. Similarly the festival is celebrated in USA, UK and France as well. We hope you like the freebies and find them useful. They are all available in PSD format and are easily editable. You can edit all the layers and can include graphic and text in all the files.